Our opinions about the status of DARK-RUMPED PETREL are quickly changing. It was initially thought to be strictly a vagrant but there are now a dozen or more records from May through October from offshore California and it may be a regular visitor in small numbers during our summer and fall. There are two populations of this bird, both of them threatened or endangered, which may account for the low numbers. Populations from Hawaii (sandwhichensis) and the Galapagos Islands (phaeopygia) differ in vocalizations and morphology (Tomkins and Milne 1991) and have been treated as separate species (e.g., Birdlife International 2000). Hawaiian birds might be called "Hawaiian Petrel" and they range at sea well north and northeast of their breeding range on Kauai (Spear et al. 1995). Their world population is estimated at 20,000 with ~5000 breeding pairs (Ainley et al. 1997, Spear et al. 1995). The Galapagos birds may be called the "Galapagos Petrel" and they generally disperse south or west of the Galapagos (Pitman 1986, Birdlife International 2000, pers. obs.) but have been recorded north to Clipperton Atoll (A.O.U. 1998). Their world population is estimated at 10,000-30,000 pairs (International Birdlife 2000); using the same ratios as in the Hawaiian estimate, this would mean perhaps 100,000 birds in all (counting non-breeders at sea). Both the Hawaiian and Galapagos populations have undergone serious declines in recent decades but conservation efforts (especially the elimination of mammalian predators on the nesting islands) may reverse this trend. If the populations were split into two species it will be difficult to separate birds at sea. The Galapagos birds average longer bills and wings. 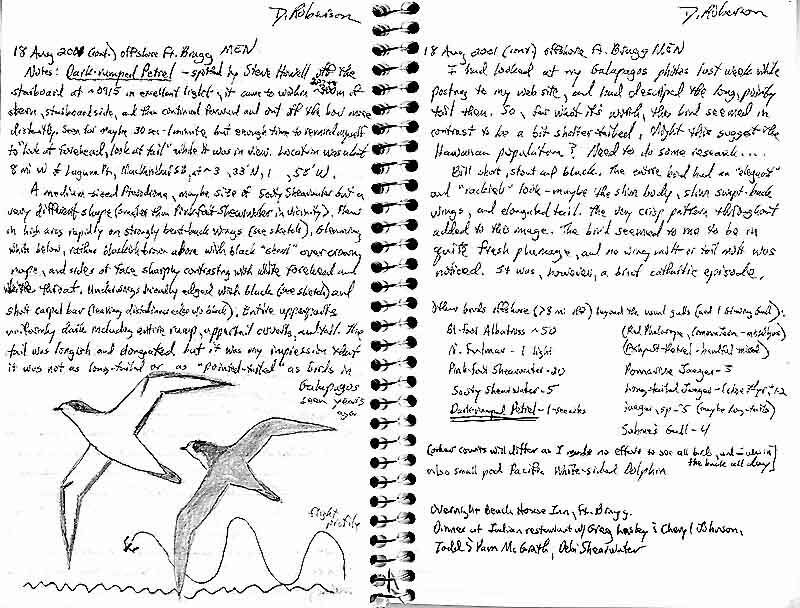 It is also my impression (as I noted in my field notes) that Galapagos birds may be longer-tailed. I have posted on line a photo of a Galapagos bird [on my Family Procellariidae page] which has a very long and pointed tail. 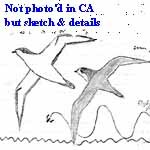 My impression of the bird seen off California was that it had a long tail but not as long nor as pointed as the Galapagos birds I had seen. It suspect that it is the Hawaiian Petrel that reaches California. Ainley, D. G., R. Podolsky, L. De Forest, and G. Spencer. 1997. New insights into the status of the Hawaiian Petrel on Kauai. Colonial Waterbirds 20: 24-30. American Ornithologists' Union. 1998. Check-list of North American Birds. 7th edition. American Ornithologists' Union, Washington, D.C. Spear, L. B., Ainley, D. G., Nur, N., and Howell, S. N. G. 1995. Population size and factors affecting at-sea distributions of four endangered Procellariids in the tropical Pacific. Condor 97:613-638. Tomkins, R. J., and Milne, B. J. 1991. Differences among Dark-rumped Petrel (Pterodroma phaeopygia) populations within the Galapagos Archipelago. Notornis 38:1-35. See the family page for county abbreviations. All photos & text © 2001 Don Roberson; all rights reserved. Readers may use this material for their own private enjoyment, study, or research but none of the photos or text herein may be used commercially nor may they be reposted on other web sites without written permission. All material is copyrighted. The posting of photos and text on this private web site is not a submission to review organizations, including, but not limited to, the California Bird Records Committee. However, blanket permission for use of descriptions by North American Birds editors in their research is granted, and serious researchers in general are granted permission to use the records cited herein.